According to the Multilayer Modular Flooring Association (MMFA), an increasing number of multilayer floor producers are turning to ecological production processes and biobased product formulations. The products highlight key phrases such as “no plasticisers dangerous to health, free of heavy metals, solvents and other harmful substances, whether soluble or volatile” and are invariably certified by recognised ecolabels such as the Blue Angel or the ECO seal, or even international labels like Greenguard in the US or the French VOC label. 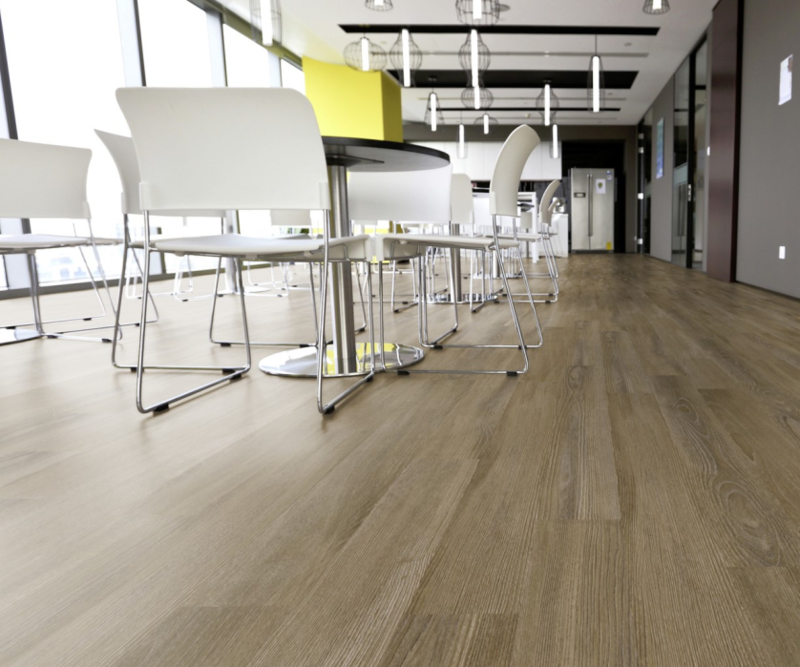 To illustrate where in product development these alternate product formulations and components lie, the MMFA used the example of luxury vinyl tile (LVT) production. With LVT, the starting material is PVC (polyvinyl chloride), which is obtained from crude oil or natural gas and sodium chloride. Depending on the manufacturing process, fillers and a number of special auxiliary agents and additives are combined with the polymer matrix to match the requirements of the application in terms of processability and technical properties. Plasticisers are then added to make the PVC more flexible and resilient while maintaining its shape. Not all plasticisers are the same and the use of dangerous, toxic phthalates such as EHP, DOP, DBP, BBP and DIBP has been restricted in the EU since 2015. The REACH Regulation (Registration, Evaluation, Authorisation and Restriction of Chemicals) has classified these low molecular weight plasticisers as Substances of Very High Concern. A number of manufacturers had already stopped using these substances before they were banned and various alternatives are now being used in flooring products. Increasingly, various polymer plasticisers that are derived from renewable raw materials and are also biodegradable, are being used for specific requirements, e.g. adipates, citrates, dibenzoates and other plasticisers outside of the phthalate group of substances. A rising number of manufacturers are now using bioplastics/biogenetic plastics made from raw materials derived partly or wholly from renewable agricultural or forestry production. For MMF production specifically, biogenic materials such as plant oil based epoxies or biopolymers belonging to the group of polyolefins (PO) are being used. These biopolymers require no stabilisers and are suitable for mechanical recycling. An EVA copolymer (ethylene-vinyl acetate) works as a binding substance, and natural mineral fillers such as chalk and kaolin are also used. Different concepts have been successfully established in the multilayer sector, such as using the natural polymer lignin as a blend partner for high-quality bio PVC. Further product variants can be manufactured by combining biovinyls with natural fibres (flax and hemp) or cork, for example. Some multilayer floor manufacturers use cork-vinyl mixtures such as these for core materials in their biobased products. The MMFA says it wishes to be actively involved in the future of this exciting and versatile flooring category, which is why it is proactively operating as an overall information provider for all market participants. This educational work aims to increase transparency and product understanding and give guidance to private and commercial suppliers and users in choosing the right product. For more information, contact the MMFA via www.mmfa.eu.